As of 2014, there are about 500,000 Holocaust survivors around the world, with some 193,000 of them living in Israel. Of these individuals, dozens die every day (FBHVI, 2014). Some people envision a time when we will be living in a world without Holocaust survivors. At Melabev, a leader in eldercare in Jerusalem specializing in Alzheimer’s care since 1981 (Sachs, 2014), a large percentage of the clients, their family members, and even the Friends of Melabev who help raise funds for its support are Holocaust survivors. They may attend one of the 4 day care centers, receive therapeutic services in their own home through “At Home with Melabev,” are part of the Moked-109 telephone reassurance service, or attend one of the support groups for caregivers (Berenbaum, 2010). Survivors have been through so much and the aging process does not always treat them kindly. This article will highlight the use of the Snoezelen room, one of the many non-pharmacological interventions used by the professional, attentive staff at Melabev day care centers (Takeda et.al.,2012). The use of a Snoezelen room can improve the quality of life of survivors and can help them share their stories from the Holocaust with others and preserve them for future generations. Some people suggest that survivors may have a higher chance of getting dementia because of the post traumatic stress disorder (PTSD) that they may have as a result of their childhood experiences during the war (Yaffe, et. al, 2010; Barak, Y, 2014; Barak & Szor, 2000). Caring for older adults with dementia requires special skills, training and sensitivity. (Kitwood, 1992). It can be more challenging when the person is a survivor of such a major life trauma such as the Holocaust. (David, 2003) Reminders of the trauma of the Holocaust are always present – different ones for different people. When a survivor is ill, cognitively or physically impaired, particular events, objects or comments may become triggers. Many normal day to day activities or situations may provoke an adverse physical, emotional or behavioral reaction. Caregivers should be aware of the more common triggers in order to be able to be more understanding of those in their care. Dr. Paula David, lecturer at the University of Toronto in Gerontology and Clinical Studies, gives a list of over thirty such triggers (David, 2003). While people are aware of the cognitive decline that accompanies dementia, the behavioral and psychological symptoms of dementia (BPSD) (Finkel et.al 1996) are usually what are more difficult for caregivers (Douglas, James & Ballard,2004). These can include depression and apathy, verbal and physical agitation, delusions, hallucinations, and even aggression (Lyketsos et.al., 2011 & Geda et.al., 2013). Non-pharmacologic treatments are recommended to help cope with these phenomena associated with dementia, because available pharmacologic treatments are only modestly effective, have notable risks, and do not effectively treat some of the behaviors that family members and caregivers find most distressing (Gitlin, Kales, Lyketsos, 2012). Non-pharmacologic interventions can include targeting environmental and underlying medical triggers, various family caregiver training programs, music, art, exercise and invoking pleasant experiences. Much more research in this area is needed in order to provide evidence for the benefits of each type of intervention and its success with specific BPSD (Lyketsos et.al., 2011 & Gitlin et.al,2011). Snoezelen is a form of multi-sensory stimulation (MSS) (Douglas, James , Ballard, 2004) that is used both to calm down Patients with Dementia (PwD) who are agitated, as well as to stimulate those that are disengaged from their surroundings (Pinkney, 1999; Chitsey et.al. 2002; Gandy, 2004). 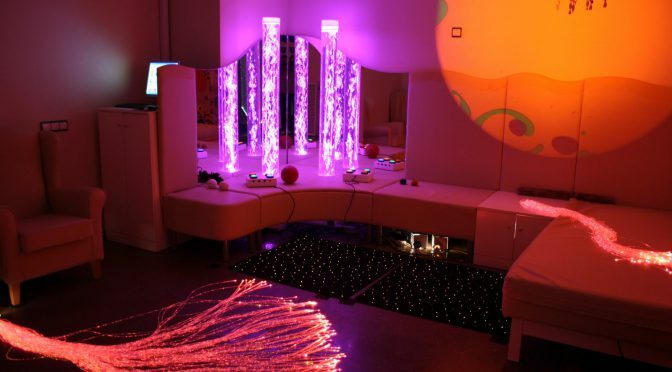 Typically, a Snoezelen therapy room consists of a wide variety of modern technologic equipment designed to provide sensory stimulation for the primary senses of sight, hearing, touch, taste and smell, through the use of lighting effects, tactile surfaces, meditative music and the odor of relaxing essential oils (Pinkney 1997). For visual stimulation, the MSS room may include a mirror ball and colored light projector, a disc projector and effects wheel, a fiber-optic spray, and a bubble tube set within 2 mirrors. Auditory stimulation may be provided by a CD player, with a selection of music and relaxation CDs (e.g., birds and sea sounds). An aromatherapy atomizer, a range of fragrant oils, and other scented items (e.g., pillows) provide olfactory stimulation. Finally, a range of items such as soft toys and rubber balls are available for tactile stimulation (Yudkowsky, 2010 ). Alongside the special physical setting is the therapeutic atmosphere created by the “enabling” therapist. A warm, accepting therapist is an intrinsic element in the facilitation of sensory stimulation. The therapist is one who adopts a non-directive approach, with no fixed agenda. The client does not have to meet any demands or expectations. Especially for those with declining cognitive functioning, this is an essential element of this therapy -they feel accepted unconditionally. It is a failure-free experience (Pinkney, 1999). The therapist tries to understand the experience from the client’s perspective and reflects the client’s communications back to him/her or mirrors the behavior. The therapist should be enthusiastically responsive to the participant using verbal and nonverbal communication. (Shapiro & Bacher, 2002). Melabev uses both Snoezelen rooms (MSS), as well as specially adapted portable Snoezeleon units, or sensokit, to work with people with dementia. Both can create the enabling environment for PwD to share memories from the Holocaust. I would like to share a story of one client who attended Melabev in order to show how the use of a Snoezeleon room successfully impacted her care and improved her quality of life and helped to preserve memories from the Holocaust that would otherwise have faded away. “Henrieta” was born in Berlin. As a young girl, shortly after Kristelnacht, she managed to get to America. Later she moved to Israel. She began attending one of Melabev’s day centers when she was about 87. At that time she was rather talkative and interested in the people around her since she had worked as a social worker. She also participated in activities, such as group discussions, word games, and singing. After a year of being an active member of the Melabev center there was a change in Henrieta. She wouldn’t talk to anyone, and she wouldn’t participate in any of the activities. She sank into a deep depression. Pharmacological treatment of the depression was not very successful and the side effects of the medications made it difficult for her to walk, so the doctor was constantly changing her medications. Depression is a common occurrence in people with dementia (Enache, 2011), but the staff felt that a Snoezelen room could benefit her. So, Henrieta was taken into the Melabev Snoezeleon room a number of times. She seemed to connect to it. In one session she was sitting across from the giant electric bubble tube. This floor-to-ceiling tube sits in one corner with the bubbles constantly changing colors. Two corner mirrors create the mesmerizing image of four bubble tubes. Seeing Henrietta’s response to the bubble tube, the therapist asked her what it made her think of. Henrietta answered, “A boat. The last time I saw my whole family before my brother and I were sent away from Germany by boat to America after Kristallnacht. We were saved, but everyone else was killed.” They continued to talk about this crucial event from her past. After the session in the Snoezelen room, when Henrietta was back with the group, she was more talkative than she had been in months. The therapist continued to take her to the room on a regular basis and they continued to discuss the events of her leaving Germany and losing her family. Since the first encounter in the Snoezelen room, Henrietta remained more upbeat and slowly returned to herself. At 90 years old, she was able to converse with the other members of the club, participate in the activities that she enjoyed in the past, and again became a “social worker” who cared for those around her. This change in Henrietta was also noticed by her family members. Her son, who is a medical professional, called the staff one day to ask them if they had given her some kind of medication, because he noticed that she was much happier, more interactive and verbal. The staff told him that, of course, they hadn’t given her any medication without consulting with the family, but what they had done differently was work with her in the Snoezelen room. The son was amazed and attributed his mother’s improvement to all the work of the Melabev staff, including in the Snoezeleon room. This story continues with another episode. After some time, another woman, who was also originally from Germany, joined the Melabev group. The staff thought it would be nice to sit the new woman next to Henrietta so she would feel more relaxed. Henrietta asked the woman where she was born, and the woman responded that she was born in Berlin. Henrietta was so amazed – she told the woman that she also was born in Berlin. They continued talking and realized that they had lived on the same street and had even attended the same Jewish school as children. The two women got very excited about encountering someone else with the same background. This excitement was experienced almost every day they met each other in the Melabev center, because both of the women had dementia and didn’t remember that they had met each other before. This is just one example of how the combination of attentive, supportive professional staff and the appropriate environment and non-pharmacological stimulant can enable a survivor to express pent up emotions that might never have been expressed, and can have a positive effect on the survivor at an advanced age, even with dementia. Just because a person has dementia does not mean they can no longer share Holocaust stories with the new generation. In order to preserve these memories before they are lost, one needs the right environment and staff to give the Holocaust survivors the opportunity. It is our responsibility to make the remaining years as positive as possible for the few survivors still living around us and let them know that we want to hear their stories and share them with generations to come. That is what Melabev tries to do every day, not just on Holocaust Remembrance day. Barak, Y., & Szor, H. (2000). Lifelong posttraumatic stress disorder: evidence from aging `Holocaust survivors. Dialogues in Clinical Neuroscience,2, 57-62. Barel, E., Van IJzendoorn, M.H., Sagi-Schwartz, A., & Bakermans-Kranenburg, M.J. (2010). Surviving the Holocaust: a meta-analysis of the long-term sequelae of a genocide. Psychological Bulletin, 136,677-698. Berenbaum, R. (ed.) (2010) Alzheimer’s and other Dementias. Treating and Coping with Mentally Frail in the Community. Jerusalem: Melabev and Eshel. Douglas, S., James, I., & Ballard, C. (2004). Non-pharmacological interventions in dementia. Advances in psychiatric treatment, 10(3), 171-177. Enache, D.; Winblad, B.; Aarsland, D. (2011) Depression in Dementia Epidemiology, Mechanisms, and Treatment. Curr Opin Psychiatry; 24(6),461-472. Eriksson, S. (2000). Impact of the environment on behavioral and psychological symptoms of dementia. International Psychogeriatrics, 12(S1), 89-91. Finkel, S. I., Costa de Silva, J., Cohen, G., et al (1996) Behavioural and psychological signs and symptoms of dementia: a consensus statement on current knowledge and implications for research and treatment. International Journal of Psychogeriatrics, 8, 497–500. Gandy, Samuel E. (2004). Snoezelen Rooms May Offer Benefits for Those With Dementia. By Alzinfo.org. Gitlin LN, Kales HC, Lyketsos CG (2012) Nonpharmacologic management of behavioral symptoms in dementia. JAMA. 308(19):2020-9. doi: 10.1001/jama.2012.36918. Hulsegge, J., & Verheul, A. (2005). Snoezelen: another world. Rompa. Kitwood, T. and Bredin, K. (1992). Towards a Theory of Dementia Care: Personhood and Well-being. Ageing and Society, 12, pp 269-287. doi:10.1017/S0144686X0000502X. Kovach, C. R. (2000). Sensoristasis and imbalance in persons with dementia. Journal of Nursing Scholarship, 32(4), 379-384. Pinkney, L. (1997). A comparison of the Snoezelen environment and a music relaxation group on the mood and behaviour of patients with senile dementia. The British Journal of Occupational Therapy, 60(5), 209-212. Pinkney, L. (1999). Snoezelen: A Sensory Environment Used By People Who Are Elderly and Confused. Sánchez, A., Millán-Calenti, J. C., Lorenzo-López, L., & Maseda, A. (2013). Multisensory Stimulation for People With Dementia A Review of the Literature. American journal of Alzheimer’s disease and other dementias, 28(1), 7-14. Shapiro, M.; Bacher, S. (2002). Snoezeling Controlled Multi-Sensory Stimulation. Beit Issie Shapiro. Israel. Yaffe, K., Vittinghoff, E., Lindquist, K., Barnes, D., Covinsky, K.E., Neylan, T., Kluse, M., & Marmar, C. (2010). Posttraumatic stress disorder and risk of dementia among US veterans. Archives of General Psychiatry, 67,608-613.